Regularity theory offers one definition of a physical law – that physical laws do nothing more than describe regularities in the universe. There are no laws that predetermine the stuff in our universe – the ‘stuff’ is all there is, and physical laws are merely ways by which we can describe regularities in the stuff. Let’s first look at a basic version of Regularity theory, which fulfils the purpose of the theory, but is susceptible to a lot of problems. For this reason, the philosopher D.H. Armstrong calls it ‘naïve regularity theory’ (NRT). We’ll then look at an improvement upon the theory called ‘systematised regularity theory’ (SRT), which solves a lot of the problems with NRT. NRT defines a physical law as: A statement about the universe that is true throughout all time and space, and does not refer to any specific object or location. If you accept this as your definition of law, then you admit that laws are descriptions about the universe. The universe doesn’t know about these rules, and is not ‘following’ them in any sense. The laws cannot cause anything to happen, and they do not ‘exist’ in reality. If we wanted to fit this into Kelsen’s scheme, we would say that the physical laws are therefore a particular subset of the set of Descriptive Statements – those statements which are true and general. A scientific law would then be a law that we suspect to be a physical law. We can never be 100% certain about whether a statement is a physical law, because we cannot test an observation at every possible point in space and time. The big problem with NRT, posed by William Kneale is that it doesn’t distinguish between things that happen by law, and things that happen by coincidence. For example, take the two statements “There will never be a gold sphere more than a kilometre across” and “There will never be a uranium sphere more than a kilometre across.” Both of these statements could be true, but the first statement is true simply because gold is rare, while the second statement is true because such a mass of uranium would be unstable. NRT cannot tell the difference between these reasons, and concludes that both statements, if true, are physical laws. Another problem is that NRT laws do not work with counterfactuals. The NRT law “Electrons have negative charge” means that all electrons in our universe have negative charge. We want the counterfactual “If there were an electron here, then it would have negative charge” to be valid. But it doesn’t really work with NRT; the law only tells us that the electrons that do exist are negative. It doesn’t say anything about electrons that don’t exist, and doesn’t predict that such hypothetical electrons are negative. This problem of extrapolation also applies to induction. The problem of induction is that there is no logical reason why we should be able to make predictions about unobserved objects based on our experience of observed objects. The statement “All swans that I have seen are white, therefore a swan that I have not yet seen will also be white” is logically invalid. If we assume the existence of a ‘law’ that affects the universe, then we can get around the Problem of Induction: “All swans that I have seen are white, therefore I assume that it is a law that all swans are white. This law means that the next swan I see will be white.” There is no equivalent way to do this with NRT law, because assuming the existence of a law automatically assumes that every object in the universe obeys the law, which is what you were trying to do in the first place. If you are inside the universe, and don’t know which statements are true/false, you cannot logically derive NRT laws because of the problem of induction. The philosopher David Lewis improves the definition of NRT law in way that solves many of the above problems. The various NRT laws can be related to each other through deduction. For example, the law “The critical mass of uranium-235 is 56kg” implies the law “There will never be a sphere of uranium more than a kilometre across.” So we can take statements as axioms, and construct deductive systems of laws. These deductive systems have two qualities, simplicity, which refers to the number/simplicity of the axioms, and strength, which refers to the number of true statements about the world that can be derived. A deductive system with “1 + 1 = 2” as its only axiom is simple, but not very strong; a deductive system with every true statement as an axiom is extremely strong, but not simple. Lewis hypothesises that there is a system out there that achieves the best compromise of simplicity and strength. He then defines SRT law as anything that is either an axiom of this best system, or can be derived from this best system. SRT law is therefore a subset of NRT law. 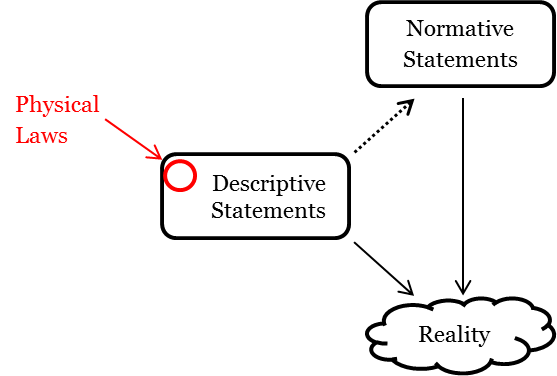 SRT law distinguishes between general statements that are true by law (“There will never be a uranium sphere more than a kilometre across”) vs. statements that are true by coincidence (“There will never be a gold sphere more than a kilometre across) – the latter kind of statement will not be in the best system, and so will not be an SRT law. We need one more caveat. Say we construct a property F with the definition ‘All things that exist, and no things that do not exist, are F.‘ Then we could take the single axiom ‘Everything is F,‘ and derive everything about the existing universe. This system is maximally simple and maximally strong, yet it is also useless. To get around this, Lewis requires that all laws of the Best System refer to ‘perfectly natural properties.’ I take these to be intrinsic, irreducible properties, like the colour-charge of quarks. A formal definition of ‘perfectly natural’ is apparently possible, but when I read about it, it very quickly went into some heavy philosophical territory, so I left it alone. Lewis argues that the best system is an ‘important’ feature of the world. Therefore, if one supposes a counterfactual such as ‘if this proton were an electron,’ the best system should hold in that counterfactual world, and so the hypothetical electron should have negative charge. Therefore, Lewis argues, SRT should be able to handle counterfactuals. An obvious criticism is that the terms ‘best,’ ‘simple’ and ‘strong’ are all, to some extent, subjective qualities, and so this system says that lawhood is dependent on the tastes of the person who examines the system. Lewis hypothesises that the best system is so far ahead that the best system will be the best by any reasonable standards. Our discoveries in fundamental physics support this, so far. A second criticism is that the ‘best’ system might not catch all the laws, because some law might be complicated or inelegant. This, I think, I missing the point – Lewis is claiming that by definition, the laws are the elements of the best system. There are no other laws ‘out there’ that the best system is failing to replicate. Armstrong, D. (1983). What is a law of nature?. Cambridge [Cambridgeshire]: Cambridge University Press. Pragmatist, (2012). Natural Laws Are Descriptions, not Rules – Less Wrong. [online] Lesswrong.com. Available at: http://lesswrong.com/lw/ct3/natural_laws_are_descriptions_not_rules/ [Accessed 11 Dec. 2014].